Carnival Corporation CEO Arnold Donald discusses making connections and being inclusive. Leading a company that conducts business in over 140 different countries and in all seven continents seems like it would be a daunting job, but Carnival Corporation CEO Arnold Donald handles it with grace and ease. “I’m really glad I didn’t say no. 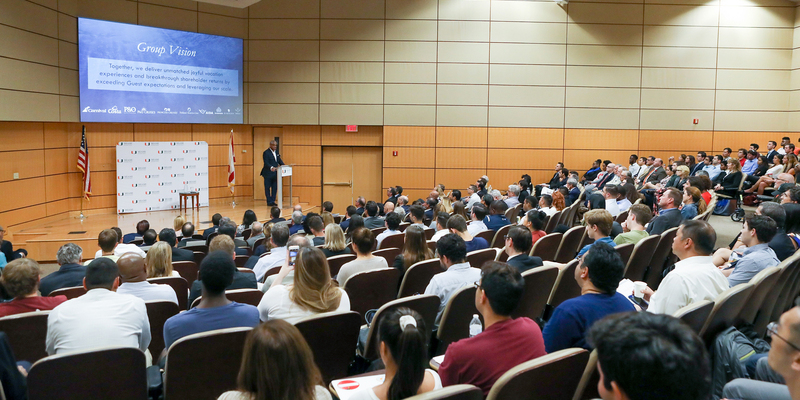 This is the best job in the world,” said Donald, who took on the role in July 2013, during the second Distinguished Leaders Lecture Series event on Monday, September 10. Starting in 1972 with only one cruise ship, Carnival Corporation has since expanded to more than 100 ships. Today, the global corporation includes Carnival and eight other leading cruise brands, such as Princess, Aida, Costa, and Holland America. When Carnival first began, the mission from the start was to create a memorable, affordable, and fun vacation for everyone. Today, catering to over 250,000 guests every day, Carnival Corporation’s 120,000 employees strive to exceed guests’ expectations on a daily basis. “At Carnival, we want to create human connections in unique ways, maybe even unexpected ways, which will enhance the guest’s experience. The human interaction of travel is really what it’s all about,” said Donald. “A team as diverse as our fleet,” Carnival prides itself on its diverse teams and providing equal respect and opportunity for each team member. Creating an inclusive community welcomes guests who may not think or act as those who might typically cruise. “At a time when countries, once again, seem to be moving apart than working together, restricting borders, exiting trade agreements, the cruise industry is an example of global cooperation,” said Donald. Carnival Corporation’s cruises visit over 700 ports a year, turning millions of travelers and their employees into global ambassadors, and “bringing hope, prosperity, and goodwill to wherever we sail,” said Donald. “Travel is the antidote to ignorance, and the more people cruise and see the world firsthand, the more they discover what they share in common, and they learn to appreciate, respect, and even celebrate their differences rather than to fear them,” said Donald. To view Donald’s entire presentation, click here. The next Distinguished Leaders Lecture Series event will take place on Monday, September 24, at 6 p.m. in the Storer Auditorium, featuring Alexandra Villoch, the president and publisher of the Miami Herald Media Company. To view the complete schedule for these upcoming Distinguished Leader Lecture Series, click here.